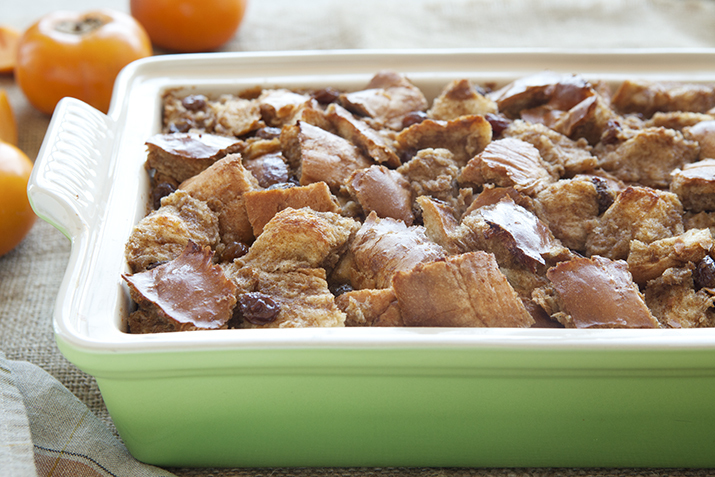 Savor the seasonal sweetness of Hachiya persimmons in this moist and delicious bread pudding. Cut the ripe fruit in half. Scoop the pulp out with a spoon and puree or mash until smooth. Measure 1 1/2 cups of puree for the recipe (refrigerate or freeze extra puree to spoon over oatmeal, yogurt or ice cream). In a bowl, whisk together the persimmon puree, eggs, milk, sugar (reserve 1 tablespoon), vanilla, cinnamon and ginger. Stir the bread and raisins into the mixture, cover and let sit in the refrigerator for at least 1 hour. Preheat the oven to 350°F. Grease a 9 x 13 inch casserole dish with butter and sprinkle the dish with 1 tablespoon sugar. Pour the bread pudding mixture into the casserole dish, spread out evenly and bake for 40 to 45 minutes until just set but still pudding-like. Remove from oven and serve warm. This seasonal dessert is best served topped with whipped cream, vanilla ice cream or yogurt, and can be served warm, room temperature or cold. You can substitute brioche or Italian white bread for the challah if desired.